You are currently browsing the tag archive for the ‘country’ tag. Ok! I’m headed off to the countryside to enjoy some apple cider, autumn foliage, and family time, but you are all going to be in great hands with the famous/infamous swashbuckler of speculative fiction, Dan Claymore! Be sure to ply him with comments. I will see you back in a week or so and don’t forget to check out my Instagram page. Any questions not addressed here should be brought immediately to the attention of the Great Flounder. I don’t know what happened but the drawings in my little book seem to have a country/horsey theme lately. Above is an equestrian jumping over some weird antiques in the middle of a nebula. Here are some down-home characters (maybe corporate mascots?) annoying a hard-working farm woman and a quail. This is a vignette sketch of the eminent bar in Park Slope. I guess this is about unwholesome sugary treats maybe? Frankly I have no idea–I am as surprised and perplexed as the vulture, however I like the expressions on the animals. The dawn horse looks so pleased. They usually look scared. This horse just looks pleased to be presented with such an array of treats. I think that gray block is a salt lick. I need to draw more horses. They are pretty but they are not an easy subject! I’m sorry I didn’t write a post last Thursday or Friday: I was away from Brooklyn on a whirlwind family trip to see the farmstead and visit my parents and grandparents. Now I love Brooklyn with all of my heart, but it was a great relief to be away from it for a little while. It was lovely to feed the thousand gentle farm creatures, to assess the growth of the plums, apples & nut trees in the orchard, and to walk back through the soybean fields into the true forest. Unfortunately there wasn’t much in the way of writing time (and there isn’t much internet access in West Virginia and southeastern Ohio anyway). However I have a few little drawings which I doodled while I was home. 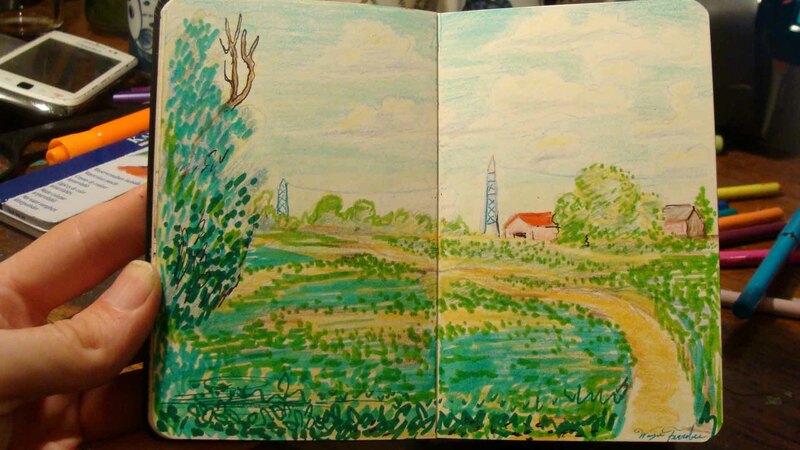 My favorite is at the top of the page—it is a view of the soybean fields as the viewer emerges from the forest and is struck by the dazzling deep green of the plants. Soybeans are a critical crop in numerous ways, but I never really noticed them as a child–perhaps because I didn’t yet love edamame, or maybe because I hadn’t become used to living in a world of asphalt and bricks. Anyway, I will write a post about soybeans, but I wanted to share a quick impression of their overwhelming glowing greenness. 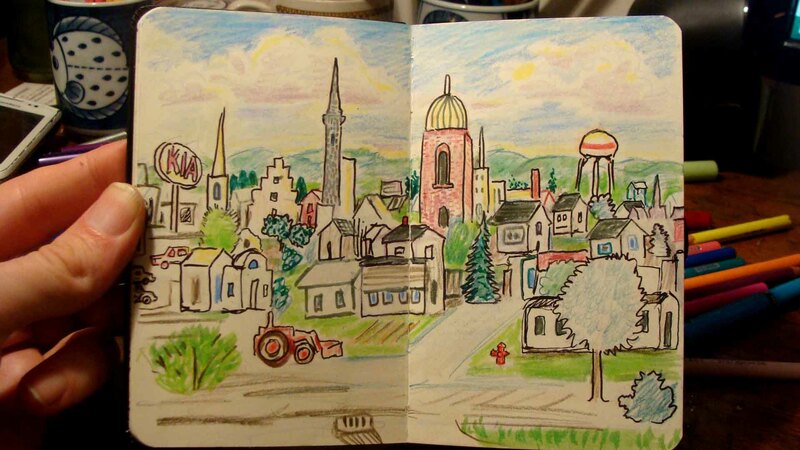 The second picture is a drawing from the road of Parkersburg, West Virginia. The town is actually both much prettier and much uglier than the sketch—there are numerous picturesque Romanesque and “Jacobethan” churches and buildings, but there also some truly dispiriting strip malls along the outskirts (which I represented with a Kia dealership). Still the town has been improving incrementally for decades—perhaps thanks to my parents’ lovely yarn shop and quilting shop (which you should totally visit if you are ever in the Midwest/Appalachian region). Speaking of quilting, I also drew a purely abstract picture of paisleys after I became fascinated by the printed patterns of the bolts of quilting cloth. Ever since the age of the Mughals, paisley has regularly come into fashion and then fallen out of it. Yet the concept seems to be much more ancient than the Scottish textile makers of the early industrial revolution or the Mughals. 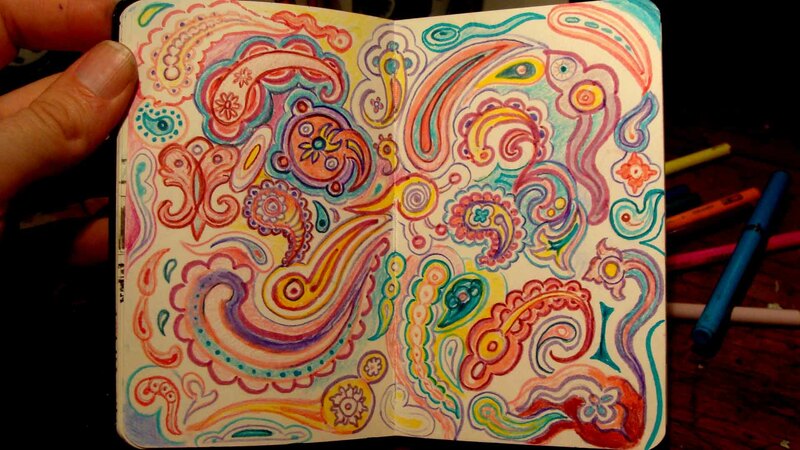 Paisley is another subject I need to blog about—because I think it is tremendously beautiful. 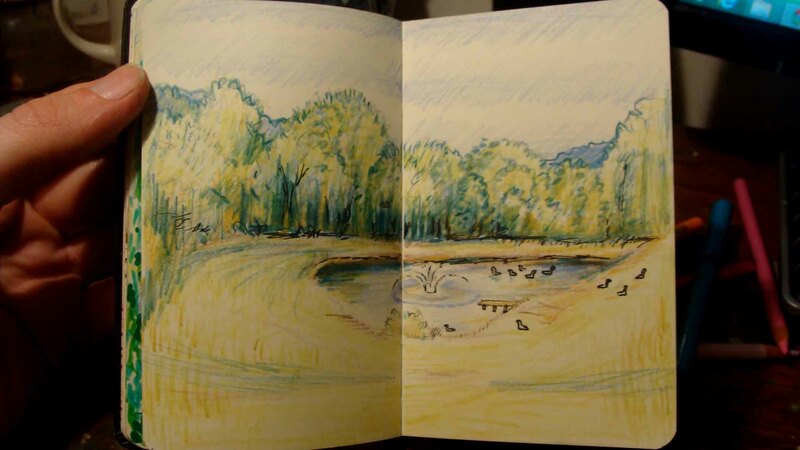 Finally there is a little drawing of the goose pond. I sketched it quickly (and from a distance) just before we drove off to the airport, but you can still see a few little pilgrim geese swimming about on it. My parents’ flock of these creatures has succeeded beyond all measure and now it is like their farm is infested with miniature dinosaurs. Everywhere you look there are geese busily gnawing on grass, biting each other’s tails, or jumping sadly (with expectant open beaks) beneath tantalizing green apples. I am sorry I didn’t do a sketch that really does justice to the lovable avine miscreants, however I am afraid that if I had stood among them long enough to draw them, they would have begun to nibble on me like a big ear of corn (which is their affectionate way of gently reminding visitors that geese get hungry for corn and lovely for attention). Thanks for looking at my drawings—now that I am back from my trip and my mind is refreshed I will try to blog about some of these new subjects!